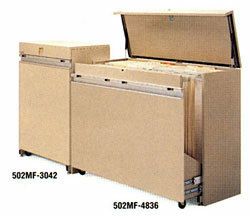 Masterfile II High density filing system allows for quick and easy docum,ent retrieval and storage. The insulated double wall construction provides excellent document protection. Utillizing the selfadhesive, pre-punched carrier strips (sold separately), the innovative pin and post system puts your documents at your fingertips. Drawing selector included. Capacity: 1,600 3-mil individual documments.